Read the 5 areas listed for details. 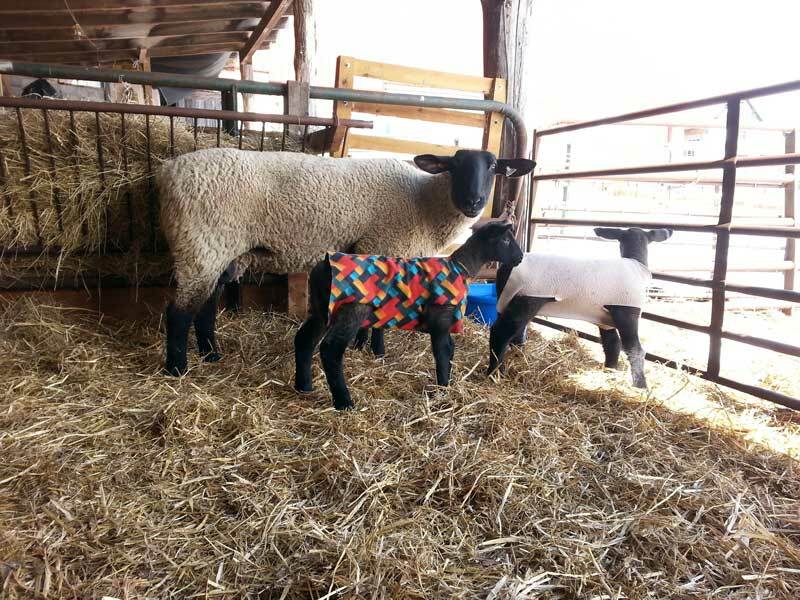 Our lambs are raised on grass & hay — plus they get a high quality textured Sheep Developer feed from the Farmers Co-Op in Frederick, MD — and Purina Show Feed from H.C. Summers in Jefferson, MD. Lambs get no growth enhancing additives — just good quality grass, hay, grain, exercise and environment. We believe lambs that are both grass-fed and grain-fed have an excellent flavor — a better flavor than just grass-fed lambs. Our grain-fed lambs grow faster than just grass-fed lambs — people say it’s the best lamb they ever had — and our lambs will grade “Choice”. A. We sell either whole lambs or half lambs. Custom-processed 2019 lambs are sold from April (Greek Easter) to January/February, 2020 — and are 5 to 11 months old. We sell no custom-processed lambs over 11 months of age. In 2020 Greek Easter is April 19, 2020. Lambs in the 130 to 145 lb. 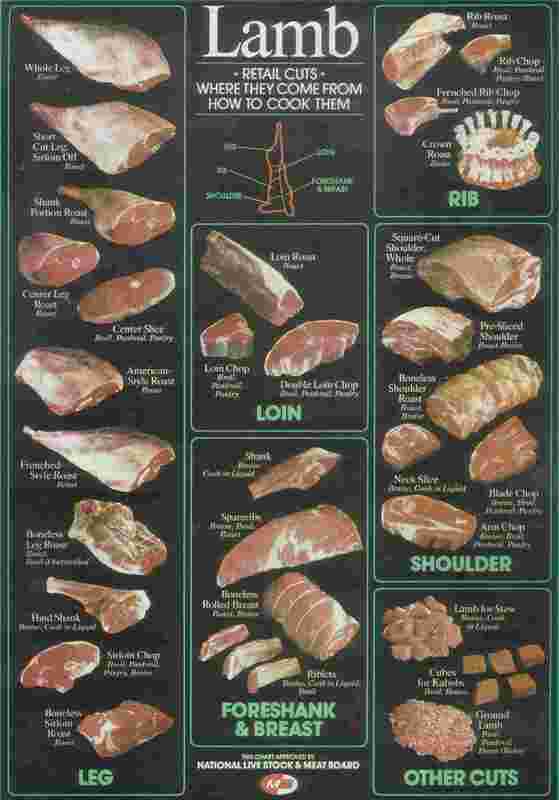 weight range will produce the best sized cuts for lamb chops, rib chops, rack of lamb, roasts, steaks, etc.). And customers get the best value for their dollar. Lambs in these weight ranges will be 7-10 months old — and since the lambs are Suffolk lambs — they’re well muscled. The lambs you see in most stores are around 110 lbs. live weight, when processed — and hopefully, still in the 8 to 11 month age range. Often lambs sold in grocery stores and Costco are imported — not American Lamb. 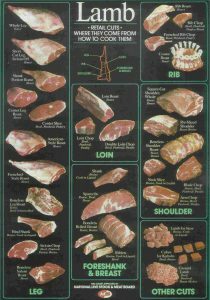 Our lambs are custom-processed at Hemp’s Meats, 3740 Jefferson Pike, Jefferson, MD 21755. Hemp’s is a small town butcher shop that’s been in business since 1849. Hemp’s has an excellent retail store. Customer’s can purchase Hemp’s custom-processed beef that’s been raised on their own farm — or, raise your own steer to be processed at Hemp’s Meats. We provide customers with our 2019 Lamb Information Form & Price List — and a 2019 Lamb Meat Order Form — which lists all the various cuts. Lambs are properly aged for 9-10 days, then custom-cut, portion controlled per your order — vacuum packed, labeled, and frozen. up to 80 lbs. — $3.20 lb. live weight. 81 to 95 lbs. — $3.00 lb. live weight. 96 to 110 lbs. — $2.80 lb. live weight — good weight range for a BBQ lamb — for Greek Easter. 111 to 125 lbs. — $2.60 lb. live weight — good weight range for lambs cooked in a China Box – or a larger BBQ system. 126 to 140 lbs. — $2.40 lb. live weight — very nice weight range for steaks, chops, roasts, rack of lamb. 141 lbs. and over — $2.20 lb. live weight — best weights for excellent steaks, rib and loin chops, roasts, rack of lamb, and that special crown rack of lamb. Plus Hemp’s custom processing cost, usually a flat $95.00 — no matter the weight of the lamb — custom processed as steaks, rib chops, loin chops, roasts, etc. — any kind of cut you want. Larger lambs will be no more than 10-11 months old. To just kill, skin, clean and customer picks-up the whole carcass, or two halves for a BBQ — Hemp’s charges $50.00. To kill, skin, clean, and cut-up the lamb carcass into 3 in. chunks for stew/soup and bagged — Hemp’s charges $80.00. Halal lambs — have males — must be processed at the customer’s own property. C. Smaller 85 to 105 lb. live wt. lambs (44-54 lbs. hanging weight) are used for BBQing — and BBQing in a China Box. Go to the “Lamb BBQ Photos” tab for a few examples. D. A few customers want their whole or half carcass fresh. Customers then cut-up and do their own packaging. We also have customers who want their lamb cut-up into 3 in. pieces and bagged — and they pick-up their lamb, fresh at Hemp’s Meats. One customer begins with the carcass, and grinds his own lamb burger. E. Lamb Organ Meat is now available. Lamb Liver: $4.00 per lb. F. Or, if we can’t help you — we refer our customers to the the farm below ⇓⇓ that has lambs and goats ⇓⇓ — and the proper on-farm processing facilities ⇓⇓. (1). Earl Gouker, Caanan Run Farm, Westminster, MD. (Carroll County). Earl’s cell phine: 1-443-506-5243 — email: neverdunfarm@msn.com Address: 1661 Old Westminster Pike, Westminster, MD 21157. Use MapQuest for directions. May also have chickens. G. Lamb Sausage and Lamb Burgers. We can supply Sweet Italian lamb sausage — and 5 oz. lamb burgers (with a bit of Sage) for your Fair and catered outings. We use the whole lamb for sausage and lamb burgers — not just the trimmings. 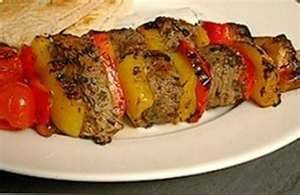 H. We do not sell individual, packaged lamb cuts — except for Sweet Italian Lamb Sausage and Lamb Burgers. We use the whole lamb, not just the trimmings. Sausage cost: $11.00 lb., in 2 lb. sausage ropes — or 1 lb. package with 4 links. Lamb burgers are 5 oz. patties Can provide sausage and lamb burgers for food stands at a Fair and catered outings. Call: 301-371-4111. Two year old Ewe 1330 with her first set of twin ram lambs — lamb tags 1537 and 1538. Ram Lamb 1538 was the 2015 Champion Suffolk Ram, as a ram lamb, at the Great Frederick Fair. Ram 1538 is now one of our 5 breeding rams. We select no more than the top 25% of ewe lambs born each year as potential breeding stock. We begin with around 20-25 ewe lambs in the late Spring. As they grow during the summer and fall — we evaluate and begin to cull out some ewe lambs that don’t meet our standards for breeding stock. These lambs are then sold to our customers as custom-processed lamb. Usually we end up with around 10-14 registered ewe lambs that we believe will become very good breeding stock. Some of these ewe lambs are loaned out (leased) to 4-H’ers who show at various County and State Fairs during the year. We only sell ewe lambs for breeding stock that we would keep as our own replacement breeding stock. Ewes are sold beginning in the summer months — ready for your County Fair and State Fair. All ewe and ram lambs are registered with the United Suffolk Sheep Association. We do not breed our ewe lambs. Why? Our policy is to have our ewe lambs reach their maximum genetic potential as a yearling. When a ewe lamb is bred at 8-9 months of age — to lamb when she is around 13-14 months old — the ewe’s pelvic area is not fully developed — the ewe is more likely to have lambing problems — and the ewe’s growth can be stunted. 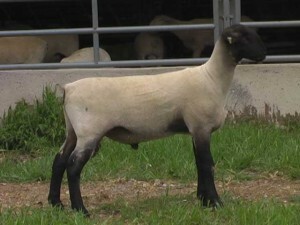 Vorac Ram Lamb at the 2015 Pennsylvania ram test. Sold at the Ram Test Sale, Aug. 1, 2015, weighed 200 lbs. at 6 months of age. We only select the very best two to five ram lambs as future show and breeding stock. The ram lambs are kept as replacement stock, sold as breeding stock to other Suffolk producers , or leased out. The best 2014 ram lamb was Vorac Ram Lamb 1446 RR/NN. As a late junior ram lamb, Ram Lamb 1446 was only shown at The Great Frederick Fair and was the Reserve Champion Suffolk Ram in the Suffolk breed show. Ram 1446 was shown as a yearling ram, but he was beat out by our Vorac 1538 RR/NN Ram Lamb as the Champion Suffolk Ram in 2015..
Two of our very good 2015 ram lambs (1506 and 1514) were on test at the PA Livestock Evaluation Center. These two ram lambs had the best loin measurements of the Suffolk Rams on test — and were sold at the PA Ram & Buck Goat Sale, Saturday, August 1, 2015. We were also developing ram lambs 1538, 1537 and 1544, three excellent ram lambs at the farm. 1538 RR/NN was shown at the Great Frederick Fair — Suffolk Breed Show — and was the 2015 Champion Suffolk Ram. His twin, Ram Lamb 1537 RR/NN was sold as breeding stock. Ram Lamb 1544 RR/NN was the Reserve Champion Suffolk Ram at the Great Frederick Fair — and was sold to a commercial producer in Pennsylvania. We kept no 2016, 2017 or 2018 ram lambs, they were sold. Two 2017 Vorac Ram Lambs 1710 RR/NN and 1722 RR/NN were on test at the PA Livestock Evaluation Center – Ram and Buck Goat Test, and were auctioned on Saturday, August 5, 2017. Our two ram lambs on test were the top two indexed Suffolk Rams. There were 24 Rams on test — and about 35 Buck Goats on test. The 2017 Sale Catalog is on the Livestock Evaluation website. Ram Lambs 1711 RR/NN and 1712 RR/NN were shown this year — and were the Champion and Reserve Champion Suffolk Rams at the Frederick County Fair. 2017 Ram Lamb 1711 was sold and Ram Lamb 1712 also sold in February. As of January 1, 2018 Ram Lamb 1712 weighed 260 lbs., at 11 months of age — and should complete his growth as a 330 lb. Yearling Ram. When rams are available, they’re leased out only to experienced Shepherds, with whom we have a working relationship. Frederick County 4-H Market Lamb Class Winners. 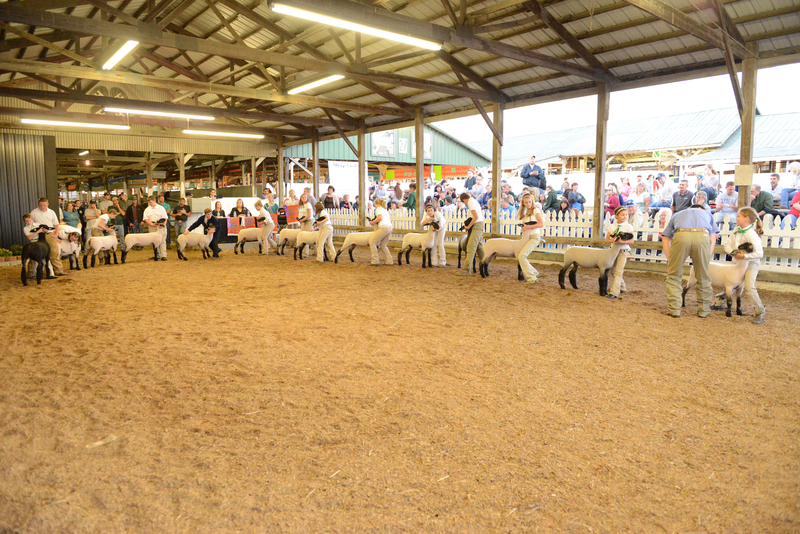 Photo of all 14 – 4-H class winners in the Champion Market Lamb Show. Judge is on the right, going over each market lamb. Often it’s very difficult to finally choose the Champion Market Lamb. Interested 4-H’ers and their parents come out to visit beginning early April — to look over available wethers (castrated males). We look over possible lambs, weigh the lambs, discuss their 4-H project goals, 4-H weigh-in dates, rate of gain goals, and County Fair dates. 4-H Project Lambs are $300.00 to $400.00 for past three years, 2017, 2018, 2019. Most 4-H Project Lambs are $350.00. Call to arrange a date and time to visit and look at possible 4-H Project Lambs. 4-H Project Lambs are picked-up by early to mid-May — their weights match the 4-H’ers County Fair dates. Most counties have their weigh-in date from mid-May to early June — and have daily rate-of-gain requirements — and minimal Fair weights. 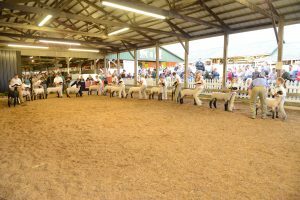 County Fairs begin in mid-July and run up to late September — so when lambs are purchased, initial weights should reflect the buyer’s County Fair dates, rate of gain requirements, and the final weight goal for their 4-H Project Lamb. We provide breeding services for small flocks who do not have a ram. In 2015 to 2018 we bred 12 to 16 ewes for other shepherds each year. Our limit is breeding 16 ewes for other shepherds. We used 5 rams in the 2014 — 5 rams in the fall of 2015 — 6 rams in the fall of 2016 for 2017 lambs — and 5 rams for 2018 lambs. Customers have their choice of rams — based on what they want to improve. Go to the next tab: “Sires & Breeding Ewes” for information on our current rams. In the summer of 2019 — call to set-up breeding dates for your ewes — based on when you want lambs to be born in 2020. For 2018 and 2019 lambs breeding costs are the same: $70.00 per ewe, plus the same $1.00 day for hay, grain, worming if needed, any shots needed, hoof trimming, and minor vet care that we can take care of. No Ring Worm, no skin infections that are contagious — and if an aged ewe — did she lamb the prior year. The plan is to begin breeding by August 25, 2019 — for late January and February 2020 lambs. We plan to use 4 breeding rams for 2020 lambs. Blood tests sent to the lab are extra. Phone: 301-371-4111 — to discuss breeding your ewes.